This is a pair of LED Signal Mirrors. These are made by Muth and are designed to replace the glass portion of the stock mirrors on your Goldwing GL1800 or F6B. They are a complete bolt in, plug and play installation. These are available in chrome glass or blue glass for reduced glare. This includes all required hardware and instructions. Note: The Australian spec bikes have a unique plug that will not fit the harness that comes with this kit. You will need to splice wires on these bikes. Please select the correct year and model as well as the desired glass style during the checkout process. Muth Signal mirrors use 7 high-intensity amber LED lamps to turn ordinary exterior rearview mirrors into safety features that command attention. (One of our pictures shows an old style with only 5 LED's) When a turn signal is activated, a flashing chevron appears in the corresponding side mirror to alert drivers in the "blind spot" of your intentions. When emergency hazard flashers are used, both mirrors flash warning signals. The mirrors function as conventional rearview mirrors whether the signals or hazards are activated or not. Muth Signal mirrors use LED lamps which illuminate 1/5 of a second faster than conventional incandescent tail lights. This provides drivers in the "blind spot" of the Signal mirror equipped vehicle an additional 17 feet of reaction distance when traveling at 65 m.p.h. 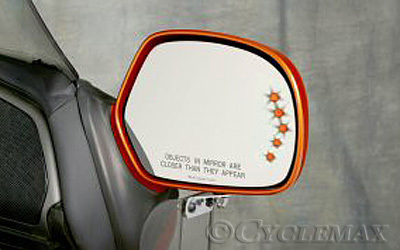 Thus, unlike other accessories that soften an accident, Signal mirrors actually may help prevent one.